When the groundwater tests for GenX came back, DEQ staff weren’t particularly surprised that nearly every monitoring well around the Chemours plant was contaminated with high levels of the compound. After all, that’s the source of GenX in the Cape Fear River and drinking water downstream. But what did surprise them is that one of the 13 contaminated wells is uphill from the facility. Since the flow of groundwater doesn’t defy gravity, some force had to put it there. State environmental officials now think that GenX is traveling through the air. From the air, GenX is “then entering the soil and the groundwater,” Assistant Secretary for the Environment Sheila Holman, told Policy Watch at a public information session in Bladen County. This process is known as “volatilization” and “atmospheric deposition.” Essentially, a chemical or compound, such as GenX, can vaporize from water and then travel through the air before falling onto the soil. It’s not unusual: For example, some pesticides can volatilize, as can dry cleaning solvents containing the cancer-causing compound PCE. Detlef Knappe, the NC State University scientist who found GenX in the Cape Fear River and Wilmington’s drinking water, said it’s quite possible that the compound is being transported through the air. He noted that in Parkersburg, West Virginia, where DuPont had discharged C8, a cousin to GenX, into the Ohio River and other streams, the chemical was found in “disconnected waters” miles apart. DEQ plans to monitor the air near the plant; detection of the compound requires special equipment. 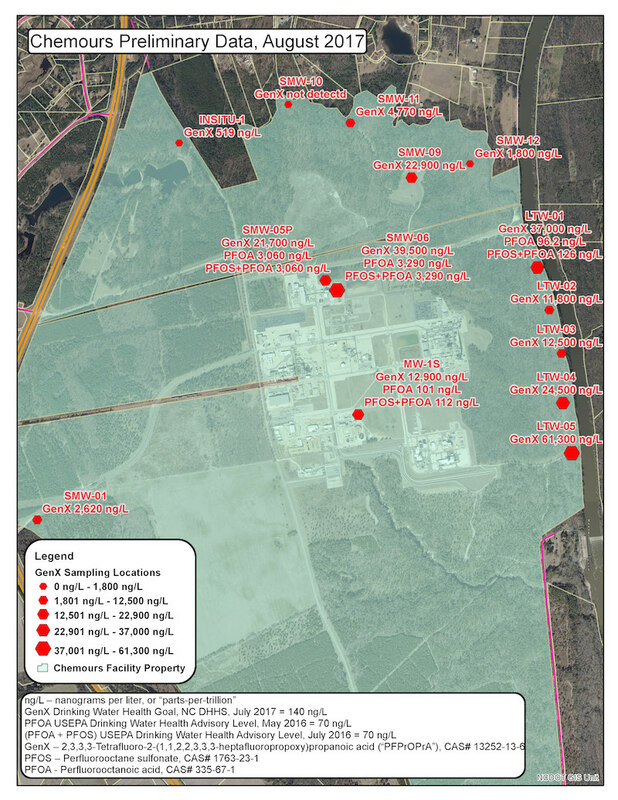 Meanwhile, today state environmental officials will begin sampling the private drinking water wells of 41 households that are adjacent to the Chemours facility for GenX and two related compounds. That sampling area is likely to expand; there are at least 97 households on private wells within a mile of the plant. Households beyond that boundary can request that DEQ sample their wells. Results will be available in four to six weeks. Last night at St. Pauls Middle School, crowds of people swarmed around maps and pointed at their homes in relation to the sampling locations within a mile and a half of the plant. DEQ had deployed their top officials — section chiefs, division heads or their deputies — to answer questions, indicating the seriousness of the situation. One man named Ed listened as DEQ discussed the sampling results. Ed remembers when Chemours — then DuPont — built the plant near the Cumberland/Bladen county line in the 1960s. “I watched them punch those wells,” he said. Chemours is offering bottled water to people living within one mile of the facility. It also implemented its own sampling plant of 30 drinking water wells in that area. However, Chemours did not provide a sampling plan to the state for review — important because polluting industries have a history of testing where they know the contaminants won’t be. Chemours subsequently gave the agency that plan, said DEQ Communications Director Jamie Kritzer. He added that the state will review the company’s testing protocol and results to ensure they were conducted correctly. Ed lives outside the sampling well boundaries, but his granddaughter lives closer to the plant, and her grandmother resides near the Chemours entrance. Because his granddaughter lives in a mobile home, “she can move,” Ed said. But the grandmother lives in a house, which, given the circumstances, would be nearly impossible to sell for its full value. “She can’t leave,” he said. DEQ entered into a sweetheart deal with Chemours – nobody – even CFPUA – had a chance to review that secretly-formed agreement – signed at 5:50 on Friday afternoon – really? The agreement seems to give Chemours a get out of jail free card for ALL prior clean water act violations – and it does not even stop all discharges – Something cozy is going on between Cooper and Chemours. This just in – John Merritt – former chief of staff for Gov Easley and former lobbyist for Titan Cement – no longer works for Chemours – I guess his work is done now that the sweetheart deal was signed?